I didn’t know when I began to watch this film that I’d be jotting down Cars 3 Quotes. I mean, you don’t really see many inspirational quotes for kids. As you know, I don’t really have a Cars aged son anymore. But, that doesn’t mean I can’t appreciate a good message when I hear/see one. I watched this film for the first time on a flight to LA. For me, it’s nostalgic, the kind of film that takes me back to my earliest years of motherhood. In a way, I’ve grown as an adult to the Cars franchise, so I’d be lying if I said I wasn’t excited to see it. I expected exceptional animation and pure entertainment. What I didn’t expect the super deep, next level inspirational quotes. So I thought it would be fun to write them down and share them with you. I even made some shareable graphics for your Pinterest, Instagram and Facebook feeds. In Cars 3 Lightning McQueen finds himself competing against newer, younger cars. He goes through an emotional battle and eventually has to be mentored to get his blaze back. Here are some of my favorite Cars 3 Quotes from Lightning McQueen that I found to be inspirational. I decide when I’m done. I can’t go out on the track and do the same old thing, it won’t work. The racing is the reward. Not the stuff. This is my last chance Cruz, my last chance. If I lose I never get to do this again. Cruz is a tough cookie. She is focused on getting Lightning McQueen back on track and she sees right through his games. Here are my favorite inspirational quotes from Cruz. Don’t fear failure, fear not having the chance. You have the chance. I used to watch you on TV, flying through the air. You seemed so fearless. I wish I knew what that felt like. It’s all about motivation, Mr. McQueen. You can use anything negative as fuel to push through to the positive! Smokey is McQueen’s coach. He was around during the highlight of Doc’s career and gives guidance and inspiration as McQueen works to get back to first place. These are my favorite inspirational quotes from Smokey. You will never be the racer you once were. Accept it. You can’t turn back the clock, kid. But you can wind it up again. You’ll never be as fast as Storm, but you can be smarter than him. Order Cars 3 on Amazon now! Commentary – Brian Fee (Director), Kevin Reher (Producer), Andrea Warren (Co-Producer) and Jay Ward (Creative Director). Theatrical Short “Lou” – When a toy-stealing bully ruins recess for a playground full of kids, only one thing stands in his way: the “Lost and Found” box. Let’s. Get. Crazy. – Learn all about the rules of demolition derby, the “rules” of figure 8 racing, and how Pixar puts the crazy in the Thunder Hollow Crazy 8 race. World’s Fastest Billboard – Pixar’s Art team to make the ”Cars 3” world as believable as possible. Blink and you will miss all of the graphics and “car-ified” advertisements. Legendary – This is a close, historical look at racing legends Wendell Scott and Louise Smith. Ready for the Race – Disney Channel’s Olivia Rodrigo and NASCAR Racer William Byron check out the Hendrick Motorsports campus to share how real-world race training influenced the filmmakers of Cars 3. Cars To Die (cast) For – Here you can explore the die-cast car hobby industry. Generations: The Story of “Cars 3” – The story of how Lightning McQueen got a complete overhaul for Cars 3. 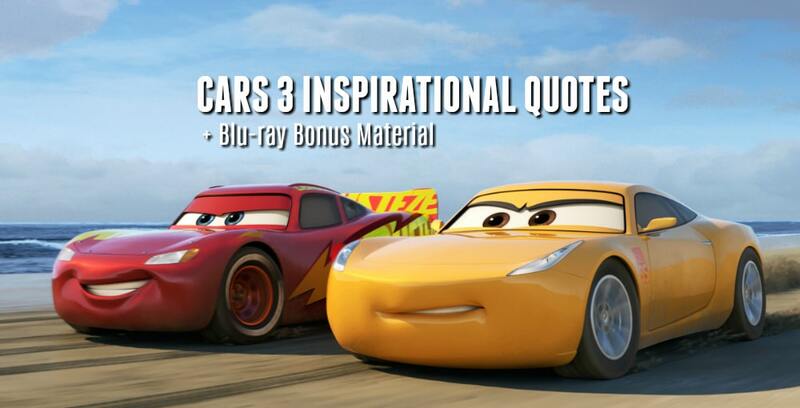 There are a lot of things you can learn from the inspirational quotes in Cars 3 no matter what age you are. Cars 3 Blu-Ray + Bonus Pack is available right now. It includes the film and loads of bonus material that you and your kids will enjoy. Special thanks to Disney/Pixar for sending me a copy of Cars 3 to review. This in no way shapes my opinions in this post. These are all great inspirational quotes for kids and adults. My favorite quote is “I can’t go out on the track and do the same old thing, it won’t work”. Great inspirational quotes! It’s nice to see these types of things in kid’s movies. I’ve been waiting to see this! I totally enjoyed watching this movie! It’s so much better than the second one, to be honest. It’s like taking you back to the first Cars movie that we all fell in love with! Thanks for the quotes! There are some good lines in this movie! It will be great to see those characters in action again! These are really lovely! The kids and I definitely enjoyed the movie and would love to get the BluRay copy! I think these quotes are very nice! That’s such a good read! The movie’s really inspiring and it was so nice that we got to watch it even if we don’t have kids! I think it’s something that people can learn from! Love the Car’s movies and so much fun to see great quote ideas come from them. We are so excited about Cars 3!! I can’t wait to watch it with my nephew. He is a huge fan! I have heard nothing but good things about Cars 3. I want to watch it soon. My son cannot wait to see this! Looks like there is a lot of inspiration in this movie. We will have to grab a copy! That is one thing Pixar has always been great at. I really need to check out the newest Cars movie. Loved the new Cars movie! I remember some of these lines, but can’t wait to bring it home to hear them again. My three girls are all huge Lightning fans! Can’t wait to see him race on the track again. I had forgotten how inspirational his story is. My youngest calls him Lightning the Queen. I hope she never gets his name right! Love the Cars movies, especially #1 and 3. Can’t wait to bring it home! I love those motivational quotes. It is good that there are life lessons that are included in an animated film. Makes it even more “a must” for kids to watch this movie. I am so happy Cars movie had so many positive quotes. Great these messages are incorporated in this movie! I like anything that gives todays children something positive. Having been diagnosed with Anxiety Oanic disorder many years ago my favorite is: Don’t fear failure, Fear not having a chance. This is really great! I think that Cars brings about some positive messages and loved reading inspirational quotes from Cars 3. Makes me want to see this movie even more. I love this movie so much! It has such a great message for kids and adults. There is Cars 3 now! I have only watched the first one! We watch all these types of films and tend to forgt that there is a hidden message, thnak for highlighting them. great qoutes.The second one is so inspiring. This is great! Never thought to look to kids movies for quotes – will have to keep an eye out! What a great inspirational quotes. This is a nice message for us to tell this movie. I think I need to start watching this Cars movie. You’ve highlighted the very reason I love kids movies- there are always inspirational gems to take away! Cars was my nephews favorite movie growing up. My favorite quote is I decide when I’m done, that’s my new quote in life. My Step-son loved the Cars movies and when we went to Disneyland a few years ago the ride was a huge hit. I haven’t identified the quotes beofre. positive message. I do love these movies. So many life lessons and it’s great to watch 1 and 3 back to back to see the continuity between them.